For anyone not a U.S. citizen, there are certain immigration consequences of getting convicted for crimes of moral turpitude and aggravated felonies. The immigration system does not give someone the leniency of being a dumb teenager. People are dumbfounded that Dharun rejected a plea deal of several hundred hours of community service and have labelled his decision as arrogant. Dharun claims that he did it because he is not guilty of a hate crime. But a guilty plea to bias-intimidation would have meant an admission of guilt for a possible aggravated felony for immigration purposes. It would have been a one-way ticket out of the United States. It is quite possible that Dharun rejected a very generous plea deal because he could have faced deportation away from his home and family if he had taken it. He decided to take his chances with a jury trial where a conviction would land him in jail precisely because he feared deportation more. Unfortunately, up against a time that an acquittal in a gay bias-crime case would have sent a bad political message, he lost the gamble and now he faces both jail time and possible deportation, depending on his sentencing and what charges DHS levies against him. The result is not just a failure of hate crime laws and our criminal justice system — it is the failure of our immigration system to afford leniency. We aren’t just punishing Dharun for being a gay-hating douche-bag; we are also punishing him for being an immigrant. 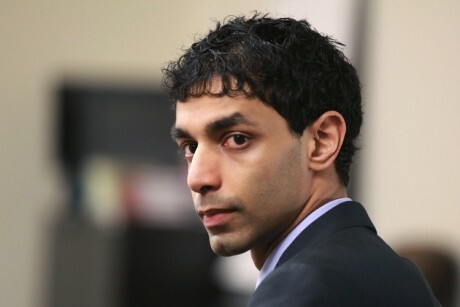 There is one essential and awkward truth that no one really wants to write or admit: not many people would really care much for punishing Dharun Ravi if Tyler Clementi had not been a white boy who killed himself. Study after study shows that a victim’s race plays a huge role in the charges levied against a defendant, in jury conviction and the number of years given during sentencing. Besides, last I checked, Brisenia Flores is still not a household name that is making national news like Tyler Clementi. Trayvon Martin is still awaiting justice. There are many more who remain nameless and faceless because the mainstream media doesn’t assign much value to our lives. To be honest, I’m kind of jealous of Tyler. Queer people of color face systemic racism, sexism and homophobia on a daily basis. We get angry, lash out at loved ones, storm about, vent and cry ourselves to sleep (or in the early morning) and go to therapy. If we end up hurting ourselves, we’re declared a danger to ourselves and hospitalized. That’s the extent of justice we receive on a daily basis till we die silent deaths. There is no perpetrator, no one to try and send to jail. After all, how do we rectify societal discrimination that is based on hatred and fear of difference? And who do we punish? As you can probably guess, I’m not a fan of hate crime laws. But that is another blog post. Dharun’s alleged discomfort of gay people does not exist in a vacuum. It’s the same kind of discomfort with difference and fear of ‘Others’ that is systemic. We see it on television. We read about it in newspapers. We experience it firsthand. Dharun just serves as a scapegoat for us. He is someone who needs to be punished because what we go through is wrong. And this is coming from someone who has faced a lifetime of actual violence for being gay and trans* from guys who look like Dharun. I don’t like the consequences of the guilty verdict. But an acquittal wouldn’t have sat well with me either. Ideally, I want Dharun and guys like him to spend their lifetimes in service to the LGBT community. But thanks to our immigration system, we are going to serve this teenager a jail sentence and deport him only. We are going to break up his family and rob them all of their American dream. That’s grand. I hope everyone is happy. Next we’ll have to deal with op-eds penned about homophobia in the Indian community because every time a minority allegedly commits a crime, our whole community is held accountable. Op-eds that will render queer South Asians invisible while pointing fingers to members of our community due to the actions of one douchebag. Op-eds that will blame Dharun for not becoming a U.S. citizen and advocate his immediate deportation because his homophobia can’t possibly be American. Op-eds that will forget that Dharun Ravi is really being punished this harshly for being an immigrant who made the right decision not to plea guilty when faced with our bankrupt immigration system. (FYI: Ravi is not pronounced Raa-vi. It is simply Ra-vi). Next → Next post: Who Gets Away With Hate Crimes? Is that why nobody cared about Larry King? Terrible example of one instance of an outcry because 1 – he was a child, 2 – the hate crime charges were dropped and 3 – his community rallied behind him and made sure he got the attention he deserved. Ultimately, his killer got off without any hate crime sentencing enhancement — very unlike the Tyler Clementi case. If your point was to show that there is no racial bias on the criminal justice system, that was a pathetic try. I was disagreeing with you saying that people wouldn’t care about Clementi if he wasn’t white, not that there wasn’t any racial bias in the criminal justice system. The whole issue of gay teens being bullied and killing themselves was attracting a lot of heat before Clementi’s suicide; his death would have gotten a lot of attention regardless. Maybe it is a contributing factor much like the rise of Gay Inc. Maybe not. We’ll never know. Completely agree with you here, this is an issue that is rarely brought up but needs to be. The constitution claims that the law shall not discriminate based upon race, religion, ethnicity, while on the other hand there are specific laws that make things so much harsher for immigrants – a US citizen in college caught for underage drinking will get cited, possibly made to do community service. What about an international? There is a very good chance they will get DEPORTED. That doesn’t spell justice to me. Perhaps they have legal grounds for doing so (since they are discriminating on citizenship status and not race explicitly), but it is certainly against the spirit of the law, and cases like this only further the trend. Well, considering the spoiled douchebag got off with 30 days, I best the author of this article feels like a real idiot. I think he should have a stiffer sentence. I don’t give a damn about skin color. The spoiled brat’s actions killed a kid and he shows absolutely ZERO remorse for it.